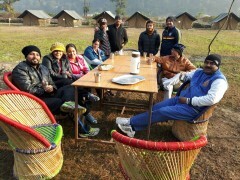 This combination of camping and rafting in Rishikesh makes for a perfect adventure-charged weekend. You’ll camp on the banks of the Heul River, with the gorgeous wilderness of the Rajaji National Park surrounding you. You can choose from activities like soft ball, cricket and volleyball, or you can go for a short walk that take you to a waterfall nearby. As night falls, you’ll gather around a crackling bonfire and eat a hearty dinner, before retiring to your tent for the night. The highlight of your trip is on Day 2, when you take on the raging currents of the Ganges! You'll paddle the 16 kms stretch that takes you from Shivpuri to Laxmanjhula, and at the end of the session, you can do some cliff-jumping and body surfing. NOTE: Participants will have park their vehicles at the road head and trek down to the campsite which is 30 metres away. Located in the Garhwal region of the Himalayas, Rishikesh is a popular getaway for adventure seekers. The raging Ganges churns as it makes its way down from the mighty Himalayas, creating rapids that can be as high as Grade III and IV. 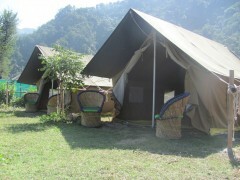 Your campsite is set on the banks of the Heule river which is one of the tributaries of the Ganga. 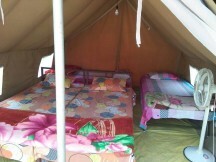 You'll be staying in Swiss tents with comfortable beds and fans, and can walk down to the river any time you choose. • Battle the churning rapids on a 16 kms stretch from Shivpuri to Laxmanjhula. • Battle Grade III and III+ rapids on the Ganges. • Stroll down the the river Heule from your campsite and dip your toes in to the cool water. 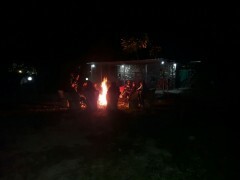 • Unwind around a warm bonfire under a starry sky. • Stay in comfortable cottages on the banks of a gurgling river . Smoking, chewing tobacco, consuming alcohol or drugs is prohibited before rafting in Rishikesh. For any cancellations made 30 days or more before check-in of this Rishikesh rafting trip: A full refund will be given, minus any transaction charges. For any cancellations made between 21-30 days prior to check-in date of this Rishikesh rafting trip: 20% of the total trip cost will be refunded, minus any transaction charges. For any cancellations made 0-21 days before check-in date of the Rishikesh rafting trip: No refund. There will be no refunds or discounts given for services unused or missed due to traveller's own fault, negligence or breach of terms on this Rishikesh rafting trip. Prices may vary for long weekends and public holidays. Children between the age of 8-12 years will be charged INR 880, but will not be allowed to go rafting. Children above 12 years of age will be charged the full amount, however, rafting is not allowed for children below 14 years. 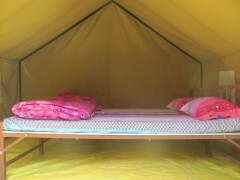 Arrive at the campsite in Mohanchatti by noon, and check in to your tent. You'll be greeted with a non-alcoholic welcome drink, and then can head for a delicious buffet lunch. After lunch, you can try outdoor games like soft ball cricket, volleyball or football in the spacious open lawns. You can walk down to the river for a paddle or go for a walk to a waterfall that is about 5 kms away. In the evening, you'll relax around a bonfire with pakodas and peanuts. You'll enjoy a delicious buffet meal before you retire to your comfortable Swiss tents for the night. Wake up early to make the most of your time at the campsite. You can indulge in yoga or hike to the river for a quick dip. You'll have a delicious breakfast at the campsite before you check out from the campsite and set off for your rafting trip. You'll battle 16 kms of the river, and then try out cliff jumping and body surfing. You'll end at Laxmanjhula, and the trip ends here. Personal expenses such as extra meals, soft drinks, packaged water, cigarettes, telephone expenses, etc. Overnight stay in deluxe Swiss tents. You'll eat a filling breakfast of egg burji, puri-bhaji/paranthe, bread, toast, tea, pickles, jam. Check out from the campsite after breakfast and head to the rafting site office in Laxmanjhula where you can drop off your luggage and head for a thrilling rafting session. After your rafting session, your trip ends. You can get to Rishikesh by air (Jolly Grant Airport in Dehradun, 50 kms away) or by road from Delhi and Chandigarh. 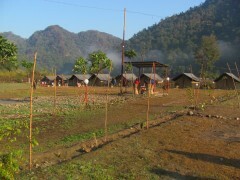 Your campsite is located near Jumpin Heights, the bungee jumping point in Mohanchatti.